Services at the Marquette University Counseling Center are free to full-time Marquette and MIAD students. 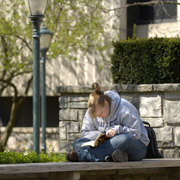 Students seeking services in the summer months (i.e., late May through August) need to be enrolled as a full-time student for either the summer or fall semester. Students who are not eligible for services at the Marquette University Counseling Center include individuals who are part-time or not enrolled as students. These students will be assisted in finding a provider in the community. Who might benefit from seeking services directly from a community provider? Students who do not meet eligibility requirements or who require highly specialized (e.g., neuropsychological assessment), longer term, or intensive treatment would benefit from seeing a community provider instead of a Counseling Center provider. Our staff is available to assist with finding an appropriate referral. What if a student only wants medication but not counseling? Numerous research studies have indicated that the best treatment for most mental health concerns is a combination of counseling and medication. For this reason, we ask that students work with both a therapist and the psychiatric provider. If a student is only interested medication s/he will be referred to a community psychiatric provider or a general practice physician. Since psychiatric services are short term, students are advised to continue treatment with their home provider if possible. How long can I receive medication at the MUCC? The student and the psychiatric provider work together to find the best treatment option for them. Students work with the psychiatric provider concurrently while they work with a counselor. All services are short term. Decisions regarding transferring care to a primary care physician or a psychiatric provider are made in collaboration with a student and assistance is provided to make a smooth transition. *If you have questions regarding eligibility, please call 414-288-7172.